Alphalite RXL LED Linear Retrofit Kit - Contact Us Today! The LED Linear Strip Retrofit Kit combines the benefits of long life, controllability, and energy savings with elegant design and superior quality of light. The RXL retrofit solution optimize LED optics and electronics to deliver energy savings and high performance while being extremely quick and easy to install. 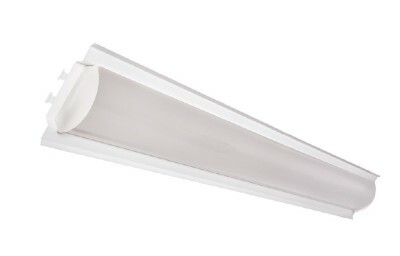 Versatile upgrade solution for existing general purspose strip luminaires. Ideal for parking garages, corridors, hallways, stairwells, offices, closets, storage rooms, warehouse, manufacturing facilities, and spaces that demand energy demand reduction and high quality light. Reflector utilizes highly reflective powder coat finish. Diffuser lens provides even and consistent light while eliminating pixelation. Toolless removal of diffuser allows access to LED array. LED module and driver are replaceable. Universal reflector brackets accomodate various strip widths. Easy and convenient installation utilizes existing luminaire body, reduces labor hours. Integrated driver eliminates additional labor. Installs on existing fluorescent strip fixtures. Utilizes existing luminaire body, eliminating the need to remove and dispose of old hardware. No need to re-mount or re-hang strip fixture. Universal reflector bracket accommodates various fixture widths. The RXL’s LED light engine and integrated optics delivers enhanced light quality and distribution. Precision-formed diffuser and reflector are designed LED light consistently, reducing glare and pixelation.